Soaring over waves, gliding along the water’s surface, flipping into the air – to the untrained eye, kitesurfing looks physically demanding, hard to master and, if we’re being honest, maybe just a little bit scary! Want to hear the good news then? It’s really not that bad. Kitesurfing is actually considered a relatively easy sport to learn, and one of the best places to take to the water is Sicily. The largest island of the Mediterranean, and the ‘toe’ in Italy’s ‘boot’, Sicily’s crystal-clear waters, shallow lagoons and windy days combine to create ideal kitesurfing conditions. 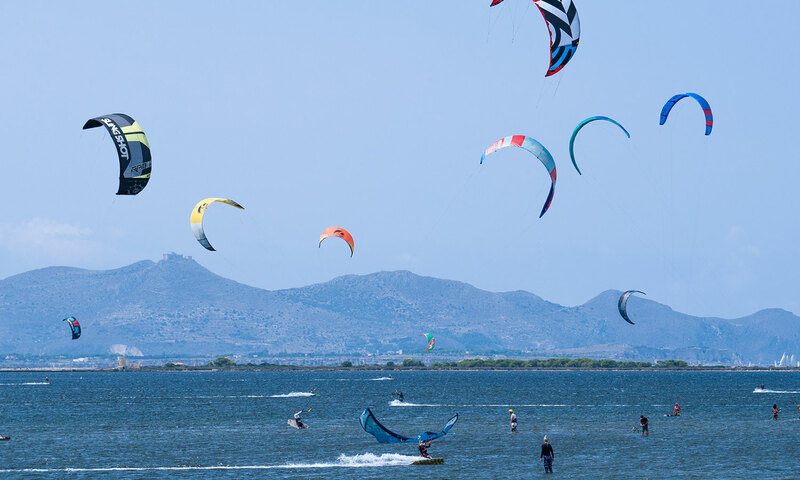 Lo Stagnone, a lagoon on the northern coastline of Marsala, is one of Sicily’s main kitesurfing hotspots. During low tide, Lo Stagnone transforms into a vast, aquatic playground, with more that 2,000 hectares of butter flat water (that’s kitesurfing lingo for water that’s not too shallow, not too deep, and great for practicing new tricks on) to enjoy. Lo Stagnone also experiences more than 300 windy days a year, which means the kitesurfing season doesn't really ever end. It’s also a great spot for both budding and expert kitesurfers. With plenty of kiteable water, beginners tend to stick close to the shoreline where the soft, muddy lagoon floor acts as a soft landing spot if you crash into the water. More advanced kitesurfers can head out into the choppier waters to practise their freestyle moves, or glide around the lagoon admiring the scenery. Learning something new. Who knows, perhaps kitesurfing could turn into a new hobby! The stunning Sicilian coast. If there’s a more picturesque place to pick up kitesurfing, we’d like to hear about it. Sore, aching muscles. We can’t help but think a day of kitesurfing is going to leave you feeling pretty exhausted – especially if you’re a newbie!